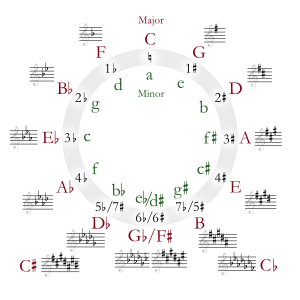 E-flat major (or the key of E-flat) is a major scale based on E♭, with the pitches E♭, F, G, A♭, B♭, C, and D. Its key signature has three flats: B, E, and A. Its relative minor is C minor, while its parallel minor is E♭ minor (or enharmonically D♯ minor). The key of E-flat major is often associated with bold, heroic music, in part because of Beethoven's usage. His Eroica Symphony, Emperor Concerto and Grand Sonata are all in this key. Also Beethoven's (hypothetical) 10th symphony is in the key of E-flat major. But even before Beethoven, Francesco Galeazzi identified E-flat major as "a heroic key, extremely majestic, grave and serious: in all these features it is superior to that of C."
Three of Mozart's completed horn concertos and Joseph Haydn's famous Trumpet Concerto are in E-flat major and so is Anton Bruckner's Fourth Symphony with its prominent horn theme in the first movement. Another famous heroic piece in the key of E-flat major is Richard Strauss's A Hero's Life. The heroic theme from the Jupiter movement of Holst's The Planets is in E-flat major. Mahler's vast and heroic Eighth Symphony is in E-flat and his Second Symphony also ends in the key. This is not to say that, in the Classical period, E-flat major was only for bombastic music with brass. "E-flat was the key [Joseph] Haydn chose most often for [string] quartets, ten times in all, and in every other case he wrote the slow movement in the dominant, B-flat." Or "when composing church music and operatic music in E-flat major, [Joseph] Haydn often substituted cors anglais for oboes in this period", and also in the Symphony No. 22 in E-flat major. For Mozart, E-flat major was associated with Freemasonry, "E-flat evoked stateliness and an almost religious character." Symphony No. 3, Op. 55 "Eroica"
Piano Sonata No. 4, Op. 7 "Grand Sonata"
Piano Sonata No. 18, Op. 31/3 "The Hunt"
Piano Sonata No. 26, Op. 81a "Les Adieux"
Symphony No. 4, WAB 104 "Romantic"
Etude in E-flat, Op. 10 No. 11 "Arpeggio"
Prelude in E-flat, Op. 28 No. 19 "Heartfelt Happiness"
Prelude Op. 31 No. 7 "Librement mais sans secousses"
Etude Op. 35 No. 7 "L'incendie au village voisin"
String Quartet Op. 33 No. 2, "The Joke"
Symphony No. 22, Hob.I:22 "Philosopher"
Symphony No. 103, Hob.I:103 "Drumroll"
Transcendental Étude No. 7 "Eroica"
Symphony No. 8, "The Symphony of a Thousand"
Piano Concerto No. 9, K. 271 "Jeunehomme"
Symphony No. 3, Op. 97 "Rhenish"
This page was last edited on 25 March 2019, at 07:58 (UTC).